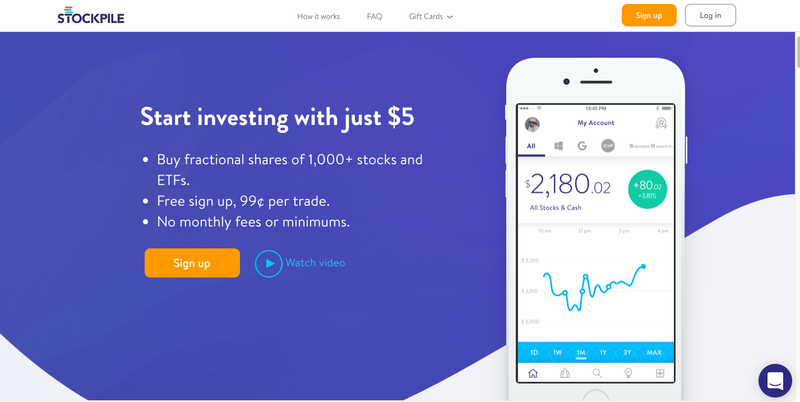 Stockpile, the startup brokerage that’s bringing fractional share investing to mainstream investors, has raised $30 million to continue its mission. The company received its latest cash injection from the Fidelity-backed Eight Roads Ventures, alongside traditional venture funds like Mayfield, Arbor Ventures, Hanna Ventures, Wang Ventures, and others. Lele argues that investing directly into companies, rather than buying fractional shares of an exchange traded fund (which is what services like Motif, Betterment, and Wealthfront offer), is more attractive for investors. Stockpile users can open an account online or using the company’s iPhone or Android app. The account is free to open, but trades cost 99 cents. Using the app to browse for potential investments is relatively easy. Once a user downloads the app the can browse for potential investments under categories like “Entertainment”, “Kids”, “Technology”, and “Food”. Rather than organize the potential stock purchases under companies, the app lists the underlying brands that a user might be familiar with, and links that brand to its parent company. Which means that if a user likes the “Jeep” brand they can search for the brand and then be taken to the option to buy Fiat stock without having to know that the brand is owned by Fiat. The company offers some basic information on the stock market in its learning section (really just some definitions of common financial terms and a bit of the arcana around stock dividends and the language of earnings reports). Pretty much though, an investor using Stockpile is on their own. It’s only a little better than picking a horse in a race because a gambler likes the name. The app pretty much makes a user rely on their feelings about a company’s brand to guide their hand when making investment decisions. For 99 cents per transaction it’s a more expensive option than Robin Hood, with an easier onboarding process and fewer bells and whistles for more sophisticated stock trades. It’s also probably not great for people who actually want to manage their money and create value through stock market investing. For that, folks would probably be better off with a service that diversifies their portfolio for them. If a user wants to gamble on the market without much information, then maybe Stockpile is the app to use. It’s managed to attract marquee investors and a lot of money (previous investors in the company’s $15 million round include Arbor Ventures, Stanford University and Ashton Kutcher). The new financing will allow the company to push its product to more millennials, according to a statement from the company. And new investment firm Eight Roads, touted the company’s ability to onboard new customers. Milstein, who is joining the company’s board of directors, doesn’t say whether having the stock market on a gift card is a good thing or a bad thing for the investor buying the stock.